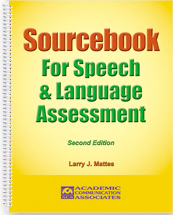 The Sourcebook for Speech and Language Assessment is designed to provide speech-language pathologists and other special education professionals with a comprehensive collection of informal assessment resources that can be used to identify individuals with communication disorders and to plan individualized intervention programs. Criterion-referenced assessment tasks, observational record forms, skills checklists, and other materials are included. Use the assessment tools with children or adults to identify learning needs, plan intervention programs, and evaluate progress. The expanded second edition of this book includes a variety of improvements in the content and format of individual assessment resources. New resources have been added to make the book even more comprehensive. A new tool, for example, has been added to assess behaviors related to autism. A section has been added with specific guidelines and strategies for assessing language learning in instructional contexts. You will use the resources in this book on a daily basis to assess articulation/phonology, phonological awareness, language, voice, and fluency. You will have dozens of assessment measures to choose from so that you can individualize the assessment based on the specific problems observed. All of the record forms can be reproduced as often as necessary- no need to spend money on large packages of record forms. Guidelines are included for conducting assessments, distinguishing differences from disorders, and determining whether or not intervention is warranted. Procedures are described for assessing how students respond to language learning activities, a critical factor in identifying individuals who truly need the direct services of a speech-language pathologist. This book will help you pinpoint specific problems that may be indicative of a language disorder. Use the comprehensive collection of criterion-referenced tasks observational protocols, and data analysis tools in this book to obtain the descriptive information that you don't get from norm-referenced tests. The book includes a procedure for the qualitative analysis of language responses that will be helpful in identifying specific problems that are affecting language performance and learning. The resources in this book will help you obtain descriptive information about performance in both structured and unstructured contexts. Collecting Background Information. This section includes forms that you can use to record information about the student's health and developmental history. The reproducible language development checklist will be helpful in determining whether or not the child has delays in the development of basic speech and language skills. Assessment of Sound Awareness, Production, and Oral Motor Skills. The measures in this section are designed for use in assessing skills related to speech sound production, oral motor development, and phonological awareness. Tasks for assessing apraxia of speech are also included. Voice Assessment. This section includes assessment tasks, record forms, and guidelines for assessing individuals with voice disorders. Speech Fluency Assessment. This section includes resources for assessing the nature and severity of stuttering problems. The information collected will be valuable in identifying the specific contexts in which disfluent speech most often occurs so that appropriate intervention programs can be planned. The record forms make it possible to record observations in a systematic manner during the course of a stuttering intervention program. Performance is assessed using structured tasks and information from connected speech samples. The author emphasizes the importance of assessing fluency as language is used for a variety of purposes. Tasks for Assessing Specific Language Skills. This section includes informal measures for assessing skill in following directions, answering questions, describing noun functions, naming word categories, describing objects, defining words, using grammatical morphemes, rapid word naming, and MUCH, much more. Using Language Samples and Observational Protocols. This section includes tools for assessing communication and recording observations during connected speech as the student uses language for various purposes. Observational checklists and language analysis record forms are included. Assessing Multicultural Students. This section includes practical resources to help speech-language pathologists distinguish communication differences from disorders when linguistically/culturally diverse students are assessed. Assessment of Language Learning in Instructional Contexts. This section includes guidelines and strategies for assessing how students interact and respond when language learning activities are presented in the classroom. Forms are included for listing instructional modifications and evaluating the results of these modifications. Information about Response to Intervention and Dynamic Assessment is included. An optional CD is available with all of the reproducible assessment forms. The CD will make it easy for you to reproduce record forms when you need them. The CD is designed to be used in conjunction with the book.